Today dawned brightly sunny and crisp, setting the perfect mood for celebrating the one-year anniversary in our new home. Sitting in our living room, flooded with natural sunlight, while sipping my early morning coffee, I was inspired to finally christen the little Strathmore watercolor sketchbook I picked up at Art of the Carolinas using a mini portable watercolor pan paintset. I hope you enjoy this little landscape as much as I enjoyed painting it! 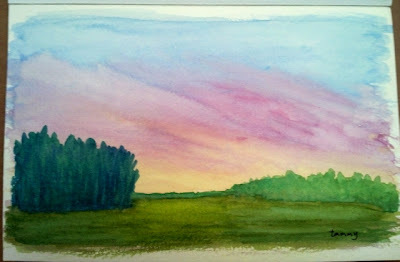 © 2013 Tammy Kaufman - A New Day - watercolors on paper 5.5" x 8.5"